Welcome to the presentations section. Each picture below can be clicked on to open up the presentation. There is no email needed to view these presentations, just sit back and enjoy! 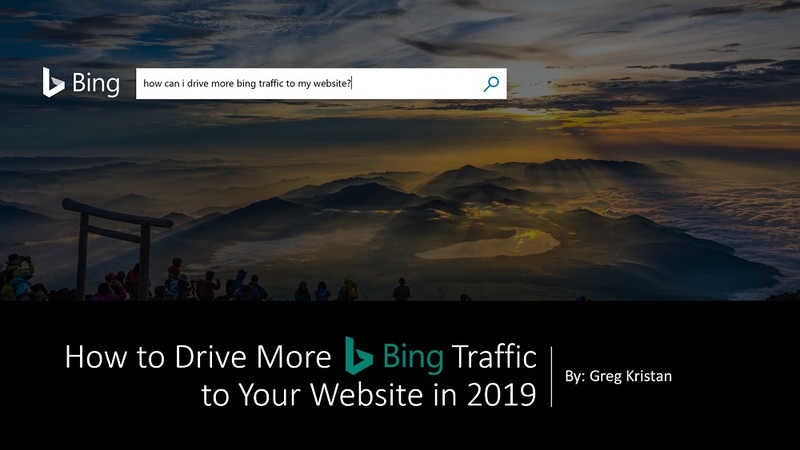 If you are looking to increase your organic traffic in 2019, Bing may be your answer. Learn how to use Bing Webmaster Tools, Bing Ads Intelligence, Bing Places for Business, and more. Bing is bigger than you think, so you should be optimizing for this search engine too. Click on the picture below to open up the presentation! SEO is one of those channels that does not return an immediate return on investment. SEO is very much the long game when it comes to your digital marketing strategy. Many times a fix or an optimization will not bare fruit for a long time. In this presentation above, I demonstrate how it took many months of continuous work to finally see fantastic results. Learn how to have your business show up for local search terms and be listed in Google and Bing maps. Google had an error count of over 20% when they were crawling my website. Using log files of my site, I was able to clean up the crawl rate of Google bot to have an error rate of 1%. If you want to learn more about this strategy, I wrote an in-depth article on how to use log files for SEO. When it comes to SEO for e-commerce sites, you need be technically sound to have success. Even the best title tags, ALT tags, and H1 tags can only drive so much traffic when you have technical issues on your site. How to Grow Your Bing SEO? Don’t overlook Bing because it’s not Google. Depending on your industry, you could receive up to 33% of all desktop click activity since Bing powers many different platforms. Verticals that see the most traffic potential are travel, finance, and auto. In this presentation above, I show how Bing Webmaster Tools can uncover a lot of new traffic potential for your website. You should look at things like cleaning up Bing’s crawl path, it’s crawl rate, and blocking specefic pages that will grow your traffic. How to Grow Your Local SEO? If you are a local business owner, you need to address a few things to rank up high in Google and Bing. Some checkpoints to drive success include correct business listings, optimizing your on-page content for local intent, and creating powerful backlinks for your website. Here is what I did for a local nonprofit organization to drive more leads to their website. I offer Boston SEO Expert Services that can unlock new potential for your business. I provide a SEO audit as well.